Setlist fails to set an applause-worthy precedent. The Sony Legacy Setlist series is a great idea, no doubt about it—live compilations of familiar tracks, unreleased tracks, and rarities "hand-picked and sequenced by aficionados and (in some cases) the artists themselves", featuring computer-accessible bonus features and liner notes essays. It's too bad then that Setlist: The Very Best of Jefferson Airplane LIVE, one of the first 11 volumes issued, fails to set an applause-worthy precedent. There are several problems here. One, most of this music is already available elsewhere. Tracks are culled from previously released live albums Bless Its Pointed Little Head (1969), Jefferson Airplane Loves You (recorded 1967, released 1992), Sweeping Up the Spotlight: Jefferson Airplane Live at the Fillmore East (recorded 1969, released 2007), and Thirty Seconds Over Winterland (1973), which begs the question: If you're a big enough Jefferson Airplane fan to want a live compilation with bonus features and rarities, why would you invest money and time into an album with music you mostly already own? Sure, this is a compilation, not intended to be a definitive live statement but more of a buffet of the band's history, considering it spans the group's discography and line-up shifts. However, this set is tailored for a very specific audience: one that might be interested in a live, career-spanning sampler but also one that doesn't own the previous live albums. That's a pretty small target. The remastered sound shouldn't sway anyone, either--most of the tracks still sound raw, and several sound brutal. When you really get down to the meat of the matter, the most attractive features of Setlist are truly the promises of rarities and unreleased material mentioned in the press release. That being said, you would think each one of these discs would include a plethora of unheard or, at least, rarely heard material. Not so—at least not in the case of Jefferson Airplane. There are two unreleased tracks here, including an extremely rough, bootleg quality take on "White Rabbit" (recorded at the Fillmore in San Fransisco, November 26, 1966), where Grace Slick's vocal can't decide between off-key and overly amplified, and you get that "bass so loud the snare head shimmers" sound through most of the recording, which is both annoying and kind of cool. Also included is a take on "It's No Secret", a track from the band's first album (recorded at the Fillmore on February 6, 1967) – like "White Rabbit", its sound quality suffers, Marty Balin's vocal distorted from poor mic placement, sound mixing, or both. 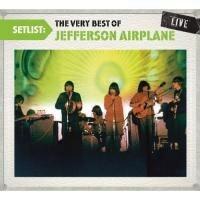 I suppose diehard Jefferson Airplane fans could find these tracks worthwhile – after all, there is something charming and electric about capturing a rock band in live, warts 'n' all mode, and there is no denying that even a decent version of "White Rabbit", still one of rock and roll's most visceral and commanding tracks, is worth hearing. I suppose this is a decent entry point for Jefferson Airplane newcomers. The featured version of "Have You Seen the Saucers?" is spot-on, proudly displaying its "Age of Aquarius" influence. It's dated and extremely corny but still a fond antiquity of the exploratory, psychedelic age. Ditto "Comin' Back to Me", where the live sound actually benefits the track, the subtle guitar noise and Balin's breathy performance adding shades of dreamy mystery. Despite the high quality of many of these tracks, the unacquainted are still better off investing in the studio albums and hearing the definitive versions, especially on the "classics" like "White Rabbit" and "Somebody to Love", one of the low points here due to weak performances and a shoddy recording. The Setlist series is a project to keep an eye on. It promises to deliver the goods, and maybe it will (similar collections are slated for Alabama, Blue Oyster Cult, Kansas, Quiet Riot, and REO Speedwagon), but with this collection, you're better off looking somewhere else for your live music experience. Setlist means well. But as we all know, politeness has never been essential to rock and roll.